Nearly a decade ago, a 12-year-old boy named Micah walked into the Scheie Eye Institute in Philadelphia with the hope of saving his vision. He was suffering from an eye disease known as retinitis pigmentosa, a condition that was then considered untreatable. Micah’s prognosis was grim, and, at a young age, he had to prepare himself for what seemed inevitable – blindness. Retinitis pigmentosa is a class of genetic disorders resulting in the progressive degeneration of the light-sensitive cells lining the region in the back of the eye known as the retina. These cells, called rods and cones, work like the film in a camera, capturing light images, which are then translated into neural signals. These signals are sent to the brain for interpretation through the optic nerve. Affecting nearly 1.5 million people worldwide, retinitis pigmentosa, in its advanced stages, results in a total loss of vision. As the disease progresses, patients with retinitis pigmentosa experience a gradual loss of photoreceptor cells. In most cases, patients first develop the decay of rods. Rods, which are located primarily around the outer regions of the retina, are responsible for both peripheral vision and night vision. The resulting night blindness (the inability to adjust visually to darkness) and tunnel vision are the two most common signs that one is suffering from retinitis pigmentosa. A person might experience difficulty driving at night or lose one’s footing in dark rooms. The second most common form of the disease, cone-rod dystrophy, manifests in the loss of cones, the photoreceptors responsible for central vision and colour perception. Whether the decay begins with the rods or cones, patients suffering with retinitis pigmentosa will ultimately experience both central and peripheral vision loss. Since retinitis pigmentosa is a genetic disorder, patients are suffering from a mutation of genes. These mutated genes deliver incorrect instructions to the photoreceptor cells, telling them to produce either too much or insufficient amounts of protein, resulting in the malfunction of these cells. Retinitis pigmentosa is also often hereditary. In fact, if one parent has the disease there is a 50 per cent chance that it will be passed along to the children. Patients planning on having children should talk to their ophthalmologist about getting genetic counselling. Advances in technology have made retinitis pigmentosa fairly easy to diagnose. An ophthalmologist might use an electroretinogram, in which electrodes are painlessly attached to the cornea, a process which measures how well photoreceptors respond to flashes of light. 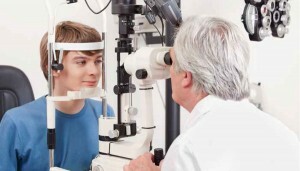 A visual field test may also be used in the diagnosis. During this test, the patient is asked to look at a fixed point and notify the doctor when objects appear in the peripheral vision. Only two decades ago, patients suffering with retinitis pigmentosa and other retinal disorders had little hope of retaining their vision. Today, patients like Micah can experience the light at the end of the tunnel. Gene therapy has emerged as a revolutionary new approach in the battle against conditions like retinitis pigmentosa. Dr. Albert Maguire, an ophthalmologist at Scheie Eye Institute, was the first to use gene therapy in the treatment of retinal diseases. After a single injection of gene therapy, children who once required special magnifying equipment to enlarge the print in books could manage without assistance, and even ride a bike unaided. In addition to gene therapy, taking supplements of 15,000 IU of vitamin A and 15 mg/dl of lutein per day has been shown to slow the progression of retinal disorders. Patients must consult an ophthalmologist before beginning any supplement regimen, as studies have indicated that exceeding 25,000 IU of vitamin A per day has been linked to liver toxicity.